With expansive bay views, this 4 bedroom, 3 bath home is a waterfront playground. Tropically landscaped, Buttonwood Shores features a bay front heated pool, protected deep water dockage complete with lighting for nighttime fishing and a boat ramp. The property also boasts a private sandy beach and entertaining frequent visits from manatees, tarpon and other aquatic wildlife that have made this inlet bay their home. This home was built with relaxation in mind. The interior of the home is well equipped with 4 bedrooms, (a king, two queens and one with 2 doubles) and three full baths. The main bath is a spa retreat with a romantic Jacuzzi tub, his and hers oversize sinks and an oversize walk in shower. The charming full size kitchen and dining room with their incredible water views have all the amenities of home. A built in breakfast area and work station complement the space. A comfortable and well appointed living room is set up for your comfort. There is also a bonus room with a full laundry. If total escape from the outside world is not an option, the entire house if fully equipped with FREE WIFI access. Direct TV is available in the living room and two of the bedrooms, with a dvd player hooked up in the other bedroom for movie watching. Located in the heart of Key Largo, and only 45 minute drive from the Miami airport, you are within walking distance of a Starbucks, and only a few minutes drive of a whole assortment of great restaurants, including Mrs. Mac’s Kitchen, The Fish House, Encore, Num Tai’s. If you like a little nightlife, The Big Chill, The Caribbeen Club, Pilot House and Snappers offer local entertainment, food and wonderful tropical beverages and again are minutes away! Gated and Private, Buttonwood Shores is a perfect vacation retreat. Best view in the Keys! 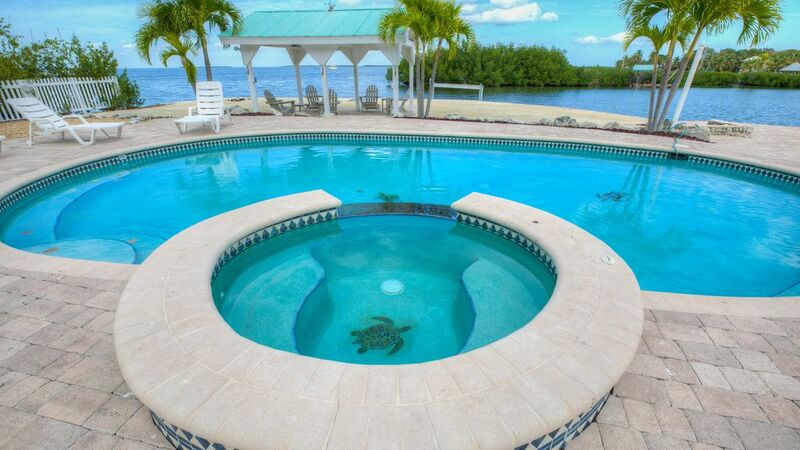 This Bay Front home has the most beautiful setting of any property we have rented in the Keys in the last 30 years. A small stand of mangroves offshore makes for a lovely, quiet bay where 4 manatees - one of them a baby - played most of the month that we were there. Manatees move further north in warmer weather, so they may not always be there - we were lucky! We enjoyed watching the local iguanas and birds that visited as well. Due to the quiet water, kayaking was a favorite pastime, even for those who had never done it before. The house itself was a good fit for our group of friends and family who visited during the month. It was generally well-equipped and within easy access of stores, restaurants and activities. The comfortably heated pool was in use all but about 3 days when the weather was cool and windy. There were plenty of lounge chairs, an outdoor table and a fire pit on the beach near the water - all of which we enjoyed during our stay. Due to the position of the house, one could find sun or shade any time of the day and the mild bay breeze kept bugs at bay. The dining table had 6 chairs plus 2 folding chairs so that 8 people can actually eat together (one of my pet peeves is a house that sleeps 8 or 10 and only has dining chairs for 6!) One house quirk is that one has to go through another bedroom to access the bathroom in the basement from the other bedroom. This was not a big issue with our group but might have been had there been another mix of guests. The local house manager was readily accessible for any questions or small issues that arose. I would definitely stay here again on another trip to Key Largo. RE: DEFAULT OWNERS CANCELLATION POLICY LISTED - ONLY IF OWNER CANCELS WILL MONIES BE REFUNDED As rentals are monthly only made usually 6-12 months in advance,, all monies are nonrefundable unless the property is re-rented under the same terms of your scheduled rental period.